Street Vendor Popcorn Machine Trolley cart only. Please note: This listing is for a. (base unit) for the Street Vendor popcorn machines. Included for this price in this listing. This is a "Brand new" Antique Trolley for Street Vendor Poppers. 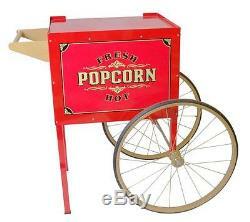 We also have the Street Vendor popcorn machine available for this cart. Dimensions 38"w x 23"d x 33h. The "deck" (where the popcorn machine sits) is 20" x 17". Street Vendor poppers are available with your choice of three different size kettles to meet your production needs. 4 ounce = 85 quarts per hour. These kettle inners are constructed of thick gauge anodized aluminum for maximum performance and easy cleaning. Aluminum provides the best heat transfer of any cookware approved alloy while the 20 mil thick anodizing armors the kettle for durability and provides a super-slick surface for easy cleaning. The kettle jackets are made from stainless steel for corrosion resistance and easy cleaning. All Street Vendor poppers have a 50 watt heating element in the base to keep the popped corn fresh and warm. Since heat rises, bottom heating is preferred to heat lamps that only heat the top layer of popped corn. The heated warming deck will keep popcorn at the ideal serving temperature for long periods of time. The warmer is necessary for situations that require that popcorn is available on demand like concession stands, convenience stores, parties or retail establishments. You wont have to worry about biting into an un-popped kernel with the Street Vendors old-maid drawer. The perforations in the bottom stainless tray allow the un-popped kernels to fall into the drawer leaving only fresh and fluffy popped corn in the holding bin. Simply rake the popped corn with a scoop and the old-maids fall through the openings. Street Vendors are designed to be simple to operate making them ideal for locations that have multiple operators. The Master Switch turns on the warming deck and the interior lamp. The Kettle Switch turns on the agitating motor and kettle heat for a popping cycle. For safety, the kettle switch will not operate without the master switch in the ON position. These high quality poppers have been engineered to provide years of service under even the most demanding of conditions. The user-friendly design of these poppers allows for in-field repairs to be made easily with standard household tools. 4 ounce popper 120 980 8.2. 6 ounce popper 120 1180 9.9. 8 ounce popper 120 1430 12.0. What size popper do I need? This tells the maximum amount of popcorn that it will produce if you were to continually pop corn for a full hour. You should determine the maximum amount of popcorn that you will need in any hour and use this table (keep in mind that Street Vendor brand poppers hold approximately 45 quarts of popped corn). Less than 85 quarts = 4 ounce popper. (makes about 5 quarts per cycle). 86-126 quarts = 6 ounce popper. (makes about 7.5 quarts per cycle). 127-170 quarts = 8 ounce popper. (makes about 10 quarts per cycle). What makes theater popcorn taste so much better than microwave popcorn? The taste and flavor of popcorn is determined by the type of oil and seasoning salt that is used in the cooking process. Most theaters use a specially formulated cooking oil that is partially absorbed by the popcorn as it pops. This is what gives the popcorn its flavor. Most microwaveable popcorn is oil-less and comes out dry and flavor-less. DND Enterprises offers a specially blended Popcorn Oil that is very low in fat and cholesterol while offering that Great Theater Popcorn taste. Quality popcorn has a moisture content of 13-14% inside the hull. When the popcorn is heated the moisture turns to steam and expands. Eventually the pressure from the expanding steam causes the hull to explode. Storing popcorn in a sealed container at room temperature or less will keep the moisture content consistent and the popcorn fresh. Avoid storing popcorn in extremely warm and dry conditions which will cause the moisture content in the popcorn to reduce. A loss of as little as 3% moisture can cause the kernel to become un-poppable (an old maid). Does a popcorn machine require much maintenance? The only maintenance required on a Street Vendor brand popcorn machine is to keep it clean. Routine cleaning only requires that the excess oil is wiped off the kettle after you finish popping (a damp cloth will do the trick). You will want to do a thorough cleaning occasionally by removing the stainless steel trays (clean in a sink or dishwasher) and cleaning the glass panels with a standard glass cleaner. For our complete line of Popcorn Machines, Machines with Carts, and Supplies. Thank you for shopping with us. We know because we have received these kinds of fake emails. We will be happy to answer your questions using eBays message system. The item "Street Vendor Popcorn Machine Trolley cart only" is in sale since Friday, July 12, 2013. This item is in the category "Business & Industrial\Restaurant & Catering\Vending & Tabletop Concessions\Tabletop Concession Machines\Popcorn". The seller is "dndenterprises0" and is located in Greenville, South Carolina. This item can be shipped to United States.